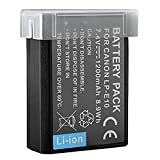 BPS LP-E10 LP E10 LPE10 battery pack is a rechargeable Li-ion battery. This entry was posted in Discount Photography and tagged 1100D, 1200DEOS, 1200mAh, 1300DCanon, Battery, CameraCanon, Canon, Capacity, Charger, Grip, High, Kiss, LCE10E, LiIon, LPE10, Real, Rebel, T3Digital by Ball Photo. Bookmark the permalink.